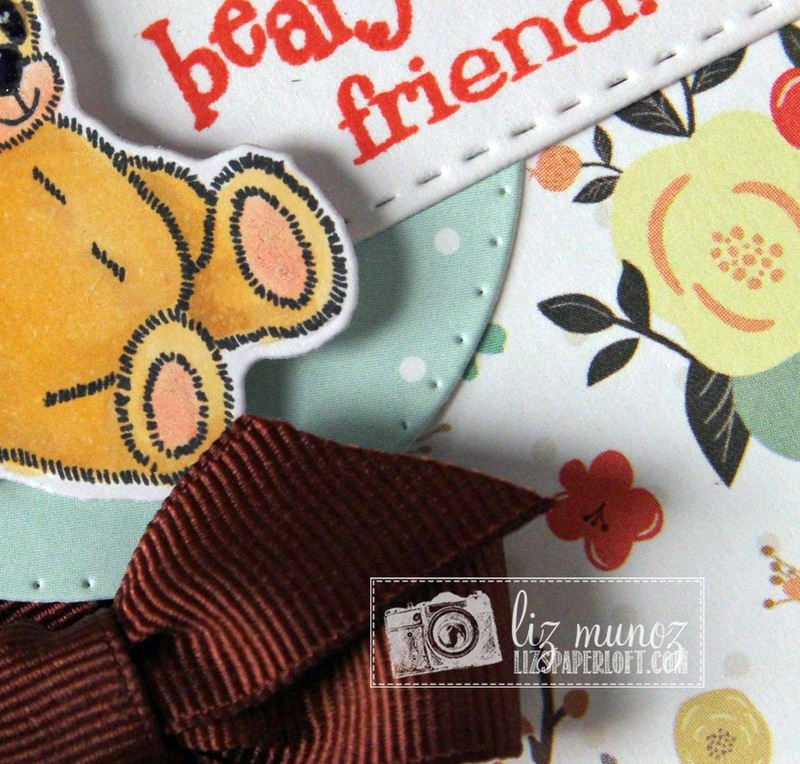 Liz's Paper Loft: MCT January Sneak Peek Day 1 ~ beary special friend! 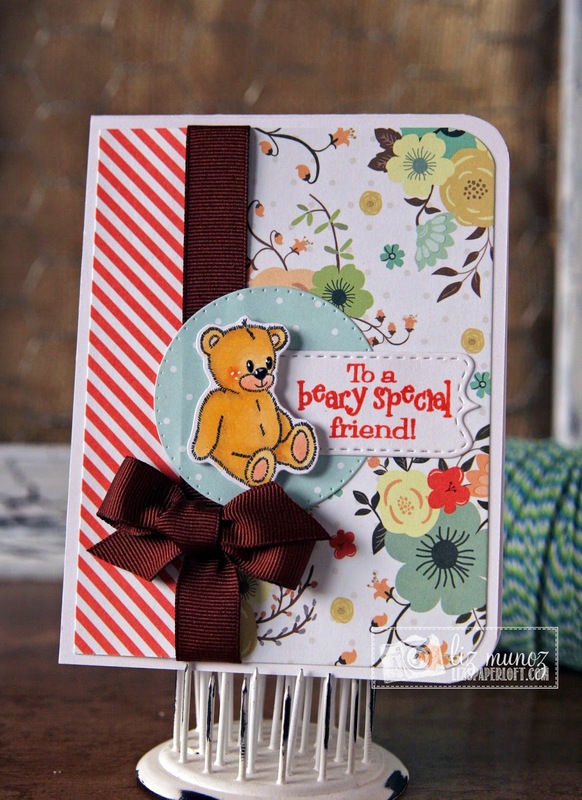 MCT January Sneak Peek Day 1 ~ beary special friend! Today is Day 1 Sneak Peek for My Creative Time January Release. This release is filled with lots of fun, for tons of creativity!!! My project for today showcases the new stamp set "I love you beary much" and "Bear Dies". If you already have "Beary Special Thoughts Stamps" then you have to have these! Who am I kidding...even if you don't have the "Beary Special Thoughts Stamp" you'll want ALL of these! I was so fast to stamp and die cut the sweet bear! For the sentiment tag I used one of the "Build a Banner Kit". You might not be able to recognize it since I "lengthened" it to fit the sentiment. This card is adorable! I simply love the pattern pattern to showcase this adorable bear that was so nicely cut out with this new die set! I'm so exited. Great card! Adorable bear! Love the combination of the stripes and the flowers too! OMF Miss Liz you sure did come up with one Beary special and super Vintage look card....I love it....gosh looks like it came from grandma's chest that was full of her treasured goodies. How do you do this??? I just love how clever and creative you are with Miss Emma's goodies and the papers are so gorgeous. WOW girl YOU so ROCK!! So pretty. I love the papers and colors you used. Your card is so super adorable Liz!! Love the papers you used!!!! AWESOME day 1 of sneaks!!!! What a perfect card to send a friend. It will make their day. Love how you made the die work with the sentiment. Thanks for sharing. Such a sweet card, Liz! Great idea to use a Build a Banner Die for the sentiment! I should remember to use those! I love this card! I love how you used the 2 different patterns!! CUTE!! thanks for sharing. This is beautiful Liz! I love the mix of papers you used! Hugs! Great card. I love the combo of elements you used. Very sweet card. Love it! Very cute and sweet card, can't wait for the rest of the week. I really like your card an the background colors,nice an bright,but the really nice blue lets you draw your eye to the bear!!! great card !! too cute! I love the paper you used. I could not have imagined how great they work together. Love your bright mix of stripes and flowers. Love the papers you have used on this sweet card. Love the layering. the little bear in the circle is a cute idea. What a gorgeous card!! Love It!! I love how every bear comes out differently in the DT! Cute, bright, and cheerful card. I love your card, is super cute and I love the combination of papers, tfs. This is extra sweet with the bear and flowers. Such a beautiful card Liz, gr8t job! Beautiful card!! Love the combination of the pattern paper! Very sweet--I like your choice of papers. The flowers are so happy and springy and the ribbon is pretty. I like the banner die extended for the sentiment...great idea. Your bear is adorable and it will be great to have a die to fussy cut him out! Sweet job on your cute card. Liz ~ This is BEAUTIFUL and ADORABLE all wrapped up in one! The design, the coloring and your paper choices are simply PERFECTION! So flipping SWEET!!! FABULOUS as always! What an enchanting card! I love all the gorgeous papers you put together on this card. Oh gosh this card is adorable! And boy do I recognize that paper you worked with.. I LOVE TC! TFS! Love your card ~ beary cute!! Lovin' how you used the banner for sentiment! This is so adorable!! The bear is so sweet!! The papers are fabulous!! What a beautiful card!! Love your card, it is so cute and the paper you used is so pretty. That bear makes me smile. AW Liz, your card is gorgeous, love the patterned paper and I love how you did the ribbon. Absolutely adorable! Your teddy and flowers are day-brighteners in every way! The new release is fabulous; how wonderful to pair it with a selection of oldies, but goodies! Gorgeous! Fabulous card! Fun pattern papers and adorable little bear!!!! Super cute sentiment to! Very cute card! Love that little bear and the papers used are perfect! Thanks so much for sharing!! Beary sweet card! You did a great job combining patterned papers, colors and embellishments! 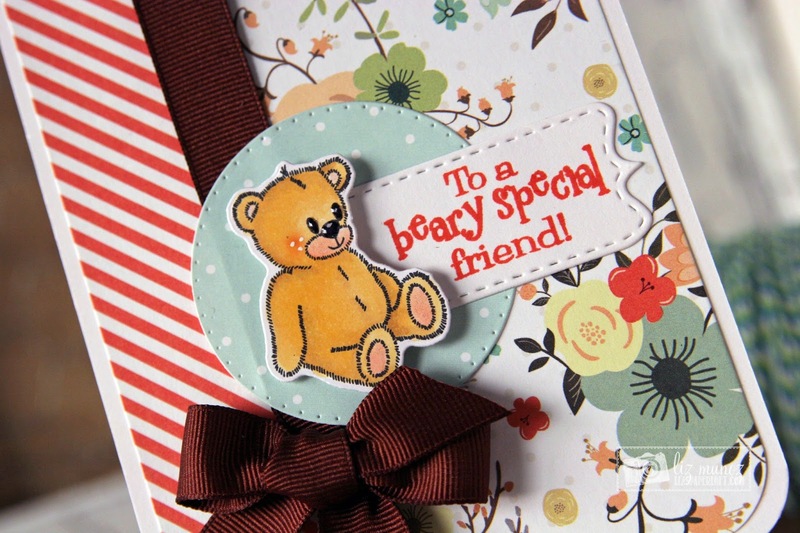 Wonderful card layout- looks like the cute bear is sitting on top of the ribbon bow- so cute. A very sweet friend card! Looking forward to what is in store for tomorrow! Love, Love, Love this card. This die will make it so much better to mass produce cards. Beautiful card! Love the color choices for the paper too! great mix of patterns and colors on your cute card! love that sweet bear! Love your card! It's so pretty! Such a fun card! Love the patterns and colors you used! The ribbon is gorgeous and I just love the sweet bear! Great sentiment too! Great card the bear is adorable. Have a Blessed day, DIANA L.
fantastic card, is so sweet! Adorable, love the patterned paper used!! Pretty card great use of the flower pattern paper. ADORABLE is an understatement!!! I cannot even wait to get these (hooray for no more fussy cutting!)! ;) And I love the way you lengthened the banner die! I need to try that...you're always giving me great ideas!